Will a Spray of Clay Conquer the Beetles of Flea? Q: I always have a problem with flea beetles on my eggplant. I follow your advice and grow the plants under row covers when they're young, but the beetles attack as soon as I take the row covers off for pollination. I sometimes use "Pyola"—but would "Surround" kaolin clay spray work better and longer to control them?" A. Flea beetles are the bane of eggplant growers. The pests are individually tiny, but their numbers are legion-esque. They hop up onto plants—like true fleas—and eat away at the leaves, causing very distinctive damage. It looks like somebody shot your poor plants repeatedly with a miniature 12 gauge. In the past, I have suggested that people protect their plants with floating row covers; until, as Deb notes, flowers begin to form and you have to remove the covers for pollination. …And I still like that plan; if the nasty little beetles get nothing to eat they'll eventually move on or die out. So one passive suggestion is to try and wait them out by keeping the covers on past the first run of flowers. Or if you want the best of both worlds, remove the covers briefly, pollinate the flowers with a little paintbrush and quickly replace the covers. …And hers was (or is) the most recent email on this important topic. Anyway, Pyola is mostly a horticultural oil spray with a tiny bit of pyrethrin added. Pyrethrin is a botanical insecticide derived from the flowers of a chrysanthemum; the amount used in Pyola is so low that the official EPA label says it's safe for bees as long as you don't spray them directly. And oil sprays in general work by smothering insects. So if you see flea beetles on the plant leaves and spray them directly with any kind of a horticultural oil, it should smother and kill them. …A thought that makes many growers smile. So if prevention has failed and you are under shotgun attack, spraying a 'light' horticultural oil—as opposed to the heavier oils used during the winter dormant season—will smother any insects the spray hits without harm to the plants. Now: What about the "Surround" clay spray Deb also mentions? These sprays of micronized clay contain no insecticide of any kind. 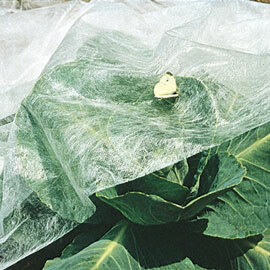 Designed to be used early in the season—before pests begin to show up in large numbers—they coat the plant with a protective whitish-grey film that seems remarkably effective at repelling a huge number of insects. …Including the dreaded flea beetle! Officially. I wanted to be sure of this, so I read through the official "product information sheet" and Surround is specifically EPA approved for control of flea beetles on leafy crops. And corn. Corn? Flea beetles attack corn? Who knew, right? So anyway, we have a good plan here: Row covers followed by clay sprays. I'll add that having some finesse will help, as clay doesn't harm bees, but a heavy layer could make it difficult for the bees to pollinate flocked flowers. So go slow and have a helper hold a little piece of cardboard or paper over each flower as you spray. Yes. When properly applied, these clay sprays make your plants look like department-store Christmas decorations. But who cares if your eggplant leaves look like Wanamaker's windows in December if it means you finally get to harvest some eggplant?! 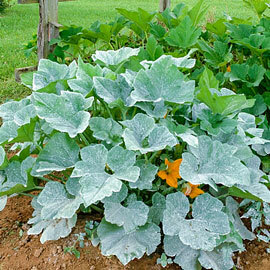 In addition, it is crucial that you begin with super-healthy plants. All insect pests are attracted first to weak spindly plants, so if you start your own plants from seed in the wrong soil without enough light, nothing will save them from attack. Same with using cheap chemical fertilizers; the super-fast and super-weak growth spurts these chemical salts cause are very attractive to pests. And finally, one of our more interesting previous Q's of the Week involving flea beetles was a 'listener's suggestion' article that included instructions on how to physically protect your plants with tall plastic 'walls' that the beetles can't jump over. And now we know that we need to get the beetles to pay for the wall! Make your eggplant great again!